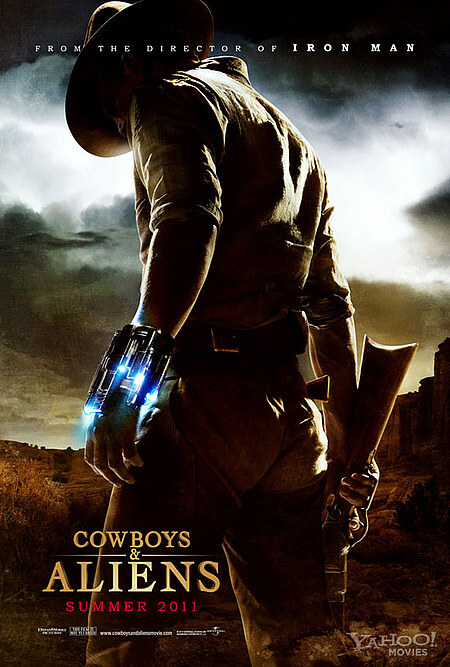 Cowboys and Aliens reaches a new apex for truth in advertising. It doesn’t have to deliver a lot to make good on the promises in its title, nor can it be accused of capriciously shifting gears to accommodate some preposterous new plot element. The genre whiplash is supposed to be the fun part. Unfortunately, Cowboys and Aliens doesn’t quite get the physics right. It aspires to be a tricked-out rollercoaster but rides more like a log flume, with only a handful of exhilarating dips and turns along its mostly straightforward, rigidly-defined path. The film begins moodily, with a man (Daniel Craig) waking up in the desert with a fresh wound in his side, a mysterious metal bracelet clamped around his wrist, and no recollection of how he obtained either. He’s accosted by a group of rough riders – human scalps hanging ominously from their saddles – on their way to a town named Absolution. So far, so good. Then Craig goes full Bourne on the ruffians, and it dawns on you that you are watching a western designed primarily for an audience that has only a vague idea of what a western looks like. The broad archetypes found in Absolution – the crusty rancher’s (Harrison Ford) entitled brat of a son (Paul Dano); the businessman afraid to get his hands dirty (Sam Rockwell); the weary, embattled sheriff (Keith Carradine) – are lazy shorthand for a lazy prologue. Then, mercifully, the aliens land. Reports of snickering theatergoers surfaced when the first trailers of Cowboys and Aliens began running in multiplexes, but Favreau has made the right choice in playing it straight. Don’t we accept the far-fetched notion of an extraterrestrial invasion in numerous films every year? Why does it matter where or when they land? They are classic alien marauders (one of their first onscreen acts of violence is some good old-fashioned cattle mutilation) in search of the earthly resources necessary to power their machines. I won’t reveal what they’re after, but the setting should eliminate some more obvious, oft-repeated possibilities. They’re also into human abduction for reasons unknown, storing the bodies inside their skyscraper-like vessel camouflaged to look like a rock formation. In a genuinely creepy sequence, Craig and his mercurial female stalker (Olivia Wilde) come across the scores of recently disappeared townsfolk, held captive in a state of prolonged hypnosis by a giant pulsating sac of fluorescent blue…something. That’s not a bad metaphor for the experience of watching this film. The action is thrilling, the leads are game, and some stuff blows up real nice, but it’s arresting in a hollow way. A rising tide does not lift all genre boats if you are as reliant on clichés as Cowboys and Aliens. The movie’s few indelible moments are largely borrowed from other films, overwhelmingly on the sci-fi side (a steamboat stranded in the middle of the desert that’s straight out of Close Encounters of the Third Kind, for instance). It’s ultimately a crummy western grafted to a mediocre alien shoot ‘em up, held back from its full potential by a surprising lack of imagination. They are researching human weakness....fyi. You missed my favorite part of the movie: how the American Indians figure in. Before seeing the movie, it seems that there's been a strange shift where the American Indians have become Aliens. After seeing the movie, you realize that it's the perfectly normal shift to absence where the American Indians are actually incredibly important, but given no credit when titularly you can focus so heavily on the white men. Ah, yes, thank you. They don't seem to be very good at such research, though. How many people do they have to cut open to understand that humans are fragile bags of flesh?